Covering a child's walls with magnetic primer and chalkboard paint can help create hours of creative fun. If you are looking to bring life to a room, painting can be a great option. There are many different types of paints to choose from. Combining two specialty paints can be a great way to make magnetic chalkboard paint. This can be a fun way to provide entertainment for children and adults alike. You can apply this type of paint easily and it can be found low-cost at a variety of stores. Covering a child’s walls with magnetic primer and chalkboard paint can help create hours of creative fun. This is a great way to allow your child to express their creativity, and it can always change as the child grows up. Not too many children can say that they are allowed to draw on their bedroom wall! This type of paint can also serve a variety of purposes in the business and restaurant world. This type of paint can be used to display greetings, menus, reminders and more! This is also a great way to incorporate magnetic letters, wall art and picture frames! If you are looking to section off a certain part of the wall, consider using tape to frame off the section that you want painted. 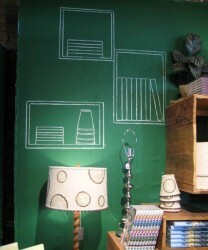 This is a great way to only make part of a wall a chalkboard. It will look like the real deal! Magnetic paint primer is a mix of primer and iron shavings. This will need to be properly shaken at the paint store. Before painting, it is also important to stir the paint thoroughly. After painting a few coats, it is a good idea to test the area with magnets. After this is applied, chalkboard paint is applied with a roller. You will need to apply two coats. After the paint dries overnight, the surface will need to be scratched with chalk. After this is wiped clean, you can continue to use the area continuously! Use magnetic chalkboard paint today to create a new and exciting look to any room!